Mars’ two moons, Phobos and Deimos, are like the bay leaves of the solar system: they’re fine I guess but what are they trying to do? The larger satellite, Phobos, is interesting because its existence is almost poetic: it’s small, falling apart due to stress, and apparently, desperately in need of validation. In new photos from NASA’s Hubble, our favorite frightened moon gloriously photobombs its dad. 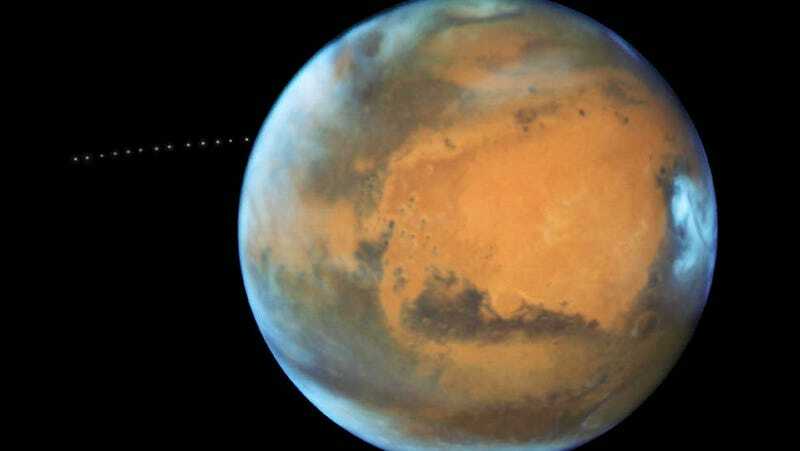 The images, taken back in May 2016, show Phobos orbiting around Mars when the planet was 50 million miles from Earth. Hubble captured the moon’s orbit in 13 exposures over the course of 22 minutes. According to NASA, Phobos orbits closer to Mars than any other moon in the solar system orbits its planet, further exhibiting its unbelievable neediness. The fact that its name literally means “panic or fear” feels offensively on-the-nose. Its easy to laugh at Phobos for being, as NASA puts it, possibly “a pile of rubble that is held together by a thin crust.” Honestly though, who among us isn’t? Phobos is doing its best, and that’s all that really matters.